Ready for the Fort Lauderdale Boat Show 2014! : Atlantic Yacht & Ship, Inc.
With 2 weeks to go we are getting ready for our in-water display with 16 pre-owned yachts for sale at this year’s Fort Lauderdale Boat Show 2014! As the host would say “Fort Lauderdale, Florida, the “Yachting Capital of the World” will host the 55th Fort Lauderdale International Boat Show on October 30-Nov 3, 2014. Show exhibits range from yacht builders and designers to exotic cars and brokerage yachts. A wide variety of boats and sea vessels will be on display including runabouts, sportfishers, high performance boats, center consoles, cabin cruisers, flats boats, skiffs, express cruisers, sailing yachts, motor yachts, bowriders, catamarans, ski boats, jet boats, trawlers, inflatables, canoes, and extraordinary superyachts. Covering seven locations and over 3 million square feet of space, the show’s transportation network of bus shuttles, water taxis, and riverboats ensures attendees can easily navigate the boat show and its expansive waterways system.” If you are planning on visiting the show, be sure to come by and say “hi” at the Atlantic Yacht & Ship display! The show starts at 10am every day and you can find our in-water reception barge, along with the 16 yachts we have available to sale, at the south west corner of the Swimming Hall of Fame, all the way out on the “face dock.” Tickets are $24 at the show, or if you plan to come on Thursday, which is the first day of the show and known as the “Prime Time Preview” that will cost you $40. Or just contact your friendly Atlantic Yacht & Ship salesman to get in on us! 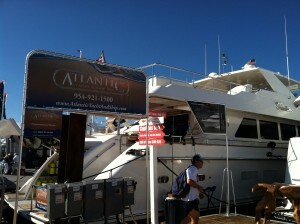 For over 53 years Atlantic Yacht & Ship has been serving the yachting community. Our headquarter sales office is dockside at Harbour Towne Marina in the heart of the yachting capital of the world, Fort Lauderdale, FL. Our in-house waterside service department provides general yacht services from new teak, to engine rebuilds, captain services, and everything in between. Whether purchasing or marketing a quality vessel, Atlantic Yacht and Ship, Inc. is your one stop resource for the highest quality service and sales in the yachting industry today. If you are looking at yachts for sale, or thinking about selling your yacht, it is always wise to have an experienced broker representing your interests throughout the deal. Contact Atlantic Yacht & Ship at 954.921.1500 or click here.